The actuator can be mounted in two different positions as shown. 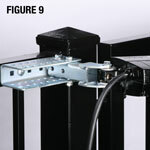 Installing the actuator on its side can allow for hiding it behind a cross member in the gate frame. The gates below are shown in the closed position. Install manual release pin, gate bracket and manual release clip to linear actuator extension rod end.